In the Linn-Mar Community School District, the safety of our students, staff and visitors is our top priority and we take this responsibility very seriously. Our school safety addresses prevention, intervention, preparedness, building security and emergency response. ALICE is a school safety program developed in 2000 to offer additional options to students and staff in dealing with an armed intruder situation. Nearly 2 million students have been trained in the ALICE protocol, now being used in universities, colleges, hospitals, churches, corporations, and government offices. The letters ALICE are an acronym that stands for Alert, Lockdown, Inform, Counter, and Evacuate. ALICE Training is the #1 active shooter civilian response training for any organization. Linn-Mar Community School District uses ALICE training with students and staff. Linn-Mar has partnered with Marion Police Department to prepare our staff and students. Our district has four staff members certified as ALICE trainers. As with other safety drills (fire and tornado), intruder drills are practiced in our school two times per year. You can teach students to be safe without scaring them. Skills and knowledge are the keys to keeping kids safe in any setting. 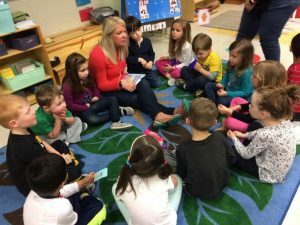 At Linn-Mar CSD, we start at preschool with education on school safety. All of our ALICE lessons are tailored to be age-appropriate. Please see below for parent resources. If you have questions, please speak to your building principal, or contact Leisa Breitfelder, Executive Director of Student Services. More information can be found at www.alicetraining.com. High School Introductory ALICE Lesson: Please play video below. 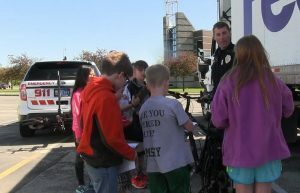 Since 2012, the Marion Police Department has assigned Tom Daubs as the School Resource Officer to assist with the students and staff of the Linn-Mar Community School District. Officer Daubs has been with MPD since 1995 and replaced the initial SRO, Officer Teahen, when he retired. Some of Tom’s duties include teaching the DARE curriculum to every 6th grader at Excelsior and Oak Ridge and assisting students and staff with their ALICE protocol (see above for ALICE information) regarding an empowered response to an armed intruder. 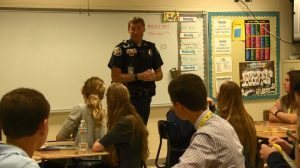 Officer Daubs spends self-initiated time at various school buildings throughout his duty day and responds to calls for service, across the district, as needed. Tom is a frequent guest speaker at annual STEM events, middle school career fairs, health classes, etc. He also assists administrators with home visits and the occasional compulsory attendance issue.